6 Jan 2018 - This painting has shown up in Mississippi, USA. A lady there bought it some 20 years ago in an antique shop and now in 2018 she decided to research the paintings signature of 'R G Roberts' and there I was in her search. Such was her generosity she has returned the painting to me. Many thanks to her. But, how did it get to the USA having been owned by Sir Alfred Nicholas, I'll probably never know the answer to that except that Sir Alfred's son may have taken the painting with him to America after his father's death. 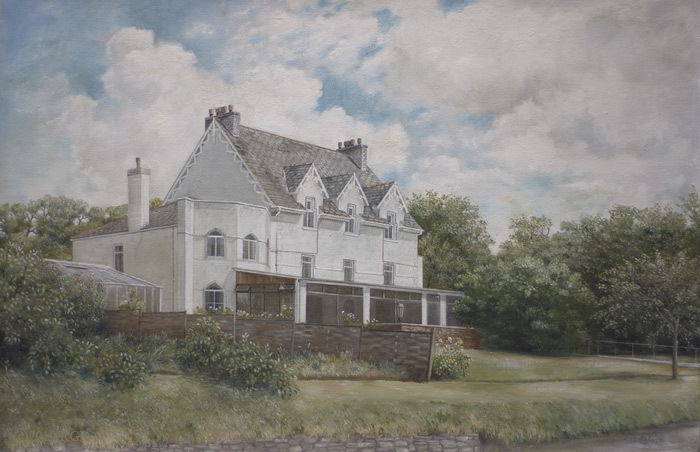 Bovil House, Machen was the home of Sir Alfred Nicholas C.B.E. - founder of South Wales Switchgear in Pontllanfraith. The house was demolished in the mid 1980's to make way for residential housing. . I produced this painting in Oct' 1979. It came about through the Bargoed and district art Society spending an evening sketching in the grounds of the house. On completion, the painting was bought by a Mr Parks as a gift for Sir Alfred Nicholas who later sent me a thank you letter. He invited me down to Bovil house one afternoon to talk about it and I mentioned that I had completed a 5 year apprenticeship (1967-1972) with South Wales Switchgear of which he was founder. We had a good chat on that subject - pleasant memories. 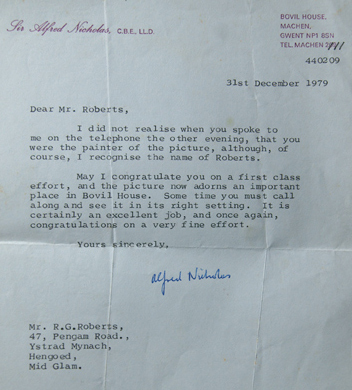 Here is the letter I received from Sir Alfred Nicholas - owner of Bovil House.